Sufi-Zentrum Rabbaniyya / Sufi Center Rabbaniyya is the official site of Shaykh Esref Efendi where his teachings, sohbets and works are presented. The site is primarily in German, but also has English translation for most of the content. The Shaykh holds regular weekly gathering where he offers spiritual teachings through conversations. Here I highlight some of his sayings. You may follow the full conversation from link provided at the end of each section. If mankind only knew what precious creatures they are, what powerful creatures they are, what capable creatures they are. They would abandon everything in order to be a "real human being”. If they knew about their own secret, if they possessed true knowledge, they would abandon everything to get their own secret. "He is my secret", Allah says. "And I am his secret." That means that mankind is the divine secret's carrier, the carrier of divine secrets. What a title! Highest title, highest label. Write it on your chest with the heavenly pen, with light, with ink made of light - write it into your heart: Carrier of divine secrets. How does the ant find its way back home in a desert? There where there is no orientation. An ant does not run straight but zigzag. How should the ant find its way back? These zigzag ways are so confusing. Fact is that the ants find their way back home. My Grandsheikh gives the example which is that difficult as in a desert there are no signs. The “city ant” has signs at least. What is the secret of that ant, finding its way back home? Don't ask for that single ant when there are thousands of ants. Don't get bogged down in details. Why am I? Where am I? These are important questions to understand yourself. And if you understand yourself, the ant from the desert and the city, the flea, horse and cow, Peter and Mehmet will come to you and introduce themselves. Even if there are millions of them. But if you understand yourself, you will be beyond physical things. And every creature on order from above has to introduce itself to you and to show its secret. Your love inside is that last remnant of this pure dimension you came from, and it is our duty to keep this pure love clean and safe. Though it is just the task of the lowest level there is, we need to re-ascend from, but you cannot do it all by yourself. The Prophet came into this world not to taunt you and to make you follow the rules by force. But to teach and support you in keeping this love pure and helping it grow. We cannot achieve this as the hate inside prevents us from being successful. Greed is the enemy that can diminish your most valuable treasure. We need help to prevent that from happening. You are limitless and Your love is boundless. 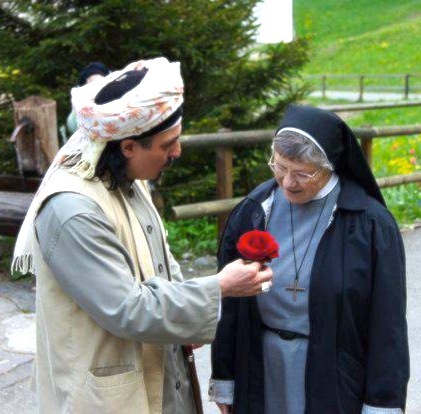 Ufuk Efendi had a conversation with a woman about Hitler and how God can allow people to commit such atrocities. Who enabled Hitler to gain power? Was it Allah or did people elect him? Which people elected him? - The German people. It is sad but true. Hitler did not fall from heaven. Who elected Hitler? Allah or the people? When people experience good things, they say it is due to them. But when bad things happen, they blame Allah for that. They don't feel responsible for their own bad deeds. The reason for this is that people don't want to take responsibility. They have electricity and things which make life more comfortable. They are using it, but do they ever think about where it is coming from? Are they thankful that Allah made their lives more comfortable? - No, they think it comes from themselves. And they start worshipping electricity. “Just as you are, so you are led”, Allah says. The time on a clock makes a circle, is moving from the start to the start again. Time is a circle. The question is: Is the time passing forwards or backwards? The clock is a symbol for time. Is the hand of the watch going forwards or backwards? Where is the beginning of time and where does it end? Is time driving you forwards or guiding you backwards? In a holy verse Allah is giving the answer: “To Me you will return.” The time is guiding us back to Allah and we can only see our existence when coming on earth. We have been existing before that but we cannot consider that. \\The one who spends his time with Allah will have his birthday every day, like a new birth. The one who does not spend his time with his Lord, his death will come - and then there will be no birthday anymore. But people like to have birthdays. And when death comes there is nothing to celebrate anymore. Time is fading - life is fading. Give a value to your time. When asking for a better life call on Allah. You need a friend for eternity not only for the moment. Be with someone who is there for eternity. Make Allah your friend and He will do you a favour - to make something eternal out of the fading. He will dress you with the dress of eternity for that your birthday will be every day. If you don’t do so, your day of death will come. [+] For a collection of Sohbet, please visit here. Shaykh Esref Efendi is a Sufi Teacher of the school of honorable Naqshibandiyya Order. He lives in Berlin / Germany since 1972 and in 1995 was authorized by Mawlana Shaykh Muhammad Nazim Adil al-Qubrusi al-Rabbani in tradition of the Naqshbandi Tariqa to serve as a spiritual guide and soul therapist. Shaykh Esref Efendi's great-grandfathers were among the Grandshaykh and consultants of the first Ottoman sultans who came from Central Asia to Anatolia. Shaykh Esref was always a reclusive self boy who preferred to read in the library of the local mosque than to play with peers. Even in the age of seven his family and friends recognized his special spiritual connection and relationship with the Holy. Finally, he was seized with his mid-twenties in a persistent melancholy, and he drew back until he met the last Grand Master Mawlana Shaykh Muhammad Nazim Adil al-al-Rabbani Qubrusi from the Golden Chain of the honorable Naqshibandiyya. The Grand Master explained to him that he had to fulfill a sacred duty and who should dedicate themselves to the service. After a few years and many trips on behalf of the Grand Master, then in 1995 he got the official authority as a spiritual guide and soul therapist to serve the people in charity. Today he is considered the founder of many Sufi centers in Germany. 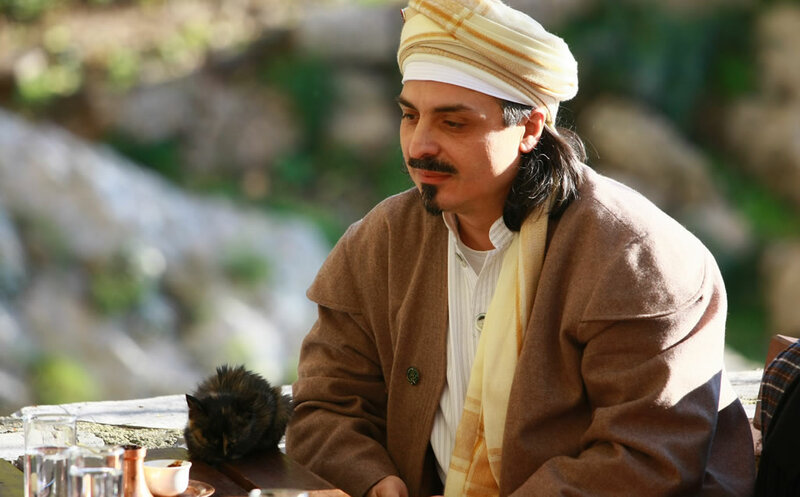 People from all cultures, traditions and religions come to his events and weekly sohbet's (spiritual talks). 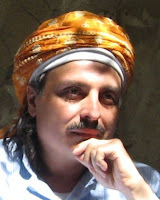 Shaykh Esref Efendi is based in Berlin, Germany where he does his work. Visit the website: Sufi Zentrum Rabbaniyya for details. Shaykh Esref Efendi is a Naqshbandi Sufi Teacher who lives in Berlin Germany and founded many Sufi Centers around the country. His Spiritual Conversations / Sohbets are shared here.